Two men with a combined 13 World Championships medals between them but no World Cup starts this season will have to wait another day to try to add to their impressive collections. 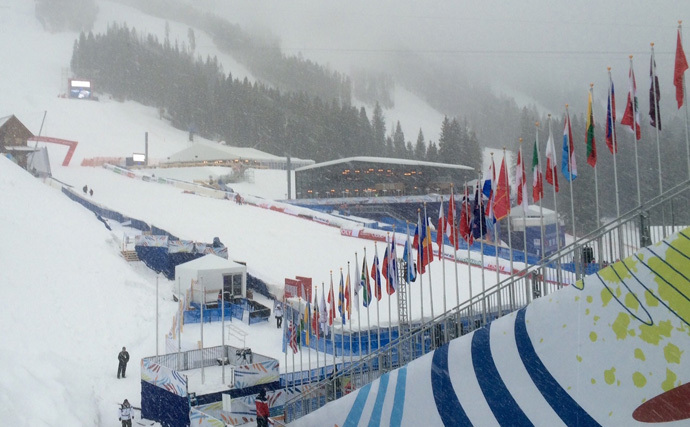 Weather caused the cancellation of the men’s super-G Wednesday. It’s been rescheduled for Thursday at 11 a.m. Both Bode Miller, who has yet to race this season following back surgery this fall, and Aksel Lund Svindal, who tore his Achilles right before the season opener, will make their debuts Thursday at 11 a.m. on the world-famous Birds of Prey course when the 2015 World Championships resume at Beaver Creek. That is, if the weather cooperates. The race was cancelled Wednesday due to snow and wind. The men’s downhill training that was scheduled for Thursday has been cancelled. “The forecast was for it to snow a lot. It didn’t. It snowed very little,” said U.S. Ski Team men’s coach Sasha Rearick. “But during inspection, it started to snow heavily and the wind picked up. The track was in good shape on the race line, but the low line needed a lot of work. The Americans decided to take advantage of the unexpected downtime. Thursday’s starters for the Americans will be Travis Ganong, Steve Nyman, defending super-G world champion Ted Ligety, Andrew Weibrecht and Miller. Three of the five (Miller, Ligety and Weibrecht) are Olympic medalists, and Miller and Ligety each have won five World Championships medals (four golds each). Svindal, though, has won eight World Championships medals (five of them golds) and he won’t even be the favorite for his own Norwegian team. That would be the red-hot Kjetil Jansrud, a three-time Olympic medalist who’s yet to win at Worlds. Women’s downhill training has been rescheduled for Thursday at 1:30 p.m. Stacey Cook, Laurenne Ross and Alice McKennis will be battling for the remaining two spots in Friday’s downhill. Lindsey Vonn will be looking to improve on her bronze in the super-G on Tuesday. All races are free and open to the public. Go to the official website for more information.